Showcasing casual contemporary style with flared arms and brightly patterned geometric accent pillows, this collection is a welcome addition to your living space. 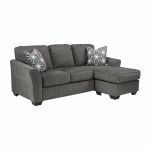 The chaise section can be easily moved to use on either side of the sofa chaise. Slate colored menswear chenille makes this a show stopping sight and comfortable resting place after a long day. 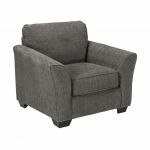 Showcasing casual contemporary style with flared arms, the Kress chair is a welcome addition to your living space. Slate colored menswear chenille makes this a show stopping sight and comfortable resting place after a long day. The Kress accent chair matches the bright patterned geometric pillows and ties the collection together.